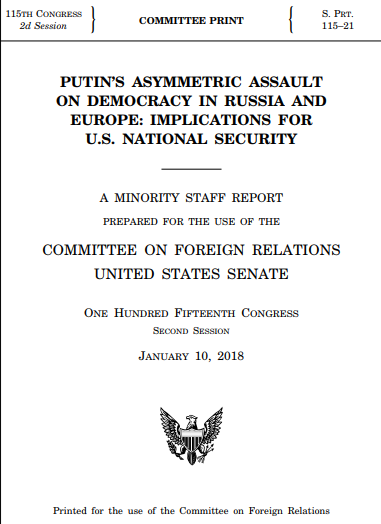 This publication and the abstract below was published by Committee On Foreign Relations United States Senate on January 10, 2018. ICIT strongly encourages you to visit the Committee On Foreign Relations United States Senate Publication Library to search for additional information security resources which are freely available. DEAR COLLEAGUES: For years, Vladimir Putin’s government has engaged in a relentless assault to undermine democracy and the rule of law in Europe and the United States. Mr. Putin’s Kremlin employs an asymmetric arsenal that includes military invasions, cyber attacks, disinformation, support for fringe political groups, and the weaponization of energy resources, organized crime, and corruption. The Kremlin has refined the use of these tools over time and these attacks have intensified in scale and complexity across Europe. If the United States fails to work with urgency to address this complex and growing threat, the regime in Moscow will become further emboldened. It will continue to develop and refine its arsenal to use on democracies around the world, including against U.S. elections in 2018 and 2020. Following attacks like Pearl Harbor and 9/11, U.S. presidents have rallied the country and the world to address the challenges facing the nation. Yet the current President of the United States has barely acknowledged the threat posed by Mr. Putin’s repeated attacks on democratic governments and institutions, let alone exercised the kind of leadership history has shown is necessary to effectively counter this kind of aggression. Never before in American history has so clear a threat to national security been so clearly ignored by a U.S. president.